This is the model for the bronze group depicting Frampton's wife, Christabel, and son Meredith (the donor). The Museum acquired it at the same time as the original bronze (Museum no. A.8-1985). This Mother and Child group was made at the height of Frampton's early career. Frampton was elected an Associate Member of the Royal Academy in 1894 and exhibited regularly across Europe, contributing to the Munich and Vienna Secession movements. This group was first shown at the Royal Academy in 1895 and subsequently at the Venice Biennale in 1897 and the Paris Exposition Universelle in 1900, where Frampton won the Grand Prix with four works. 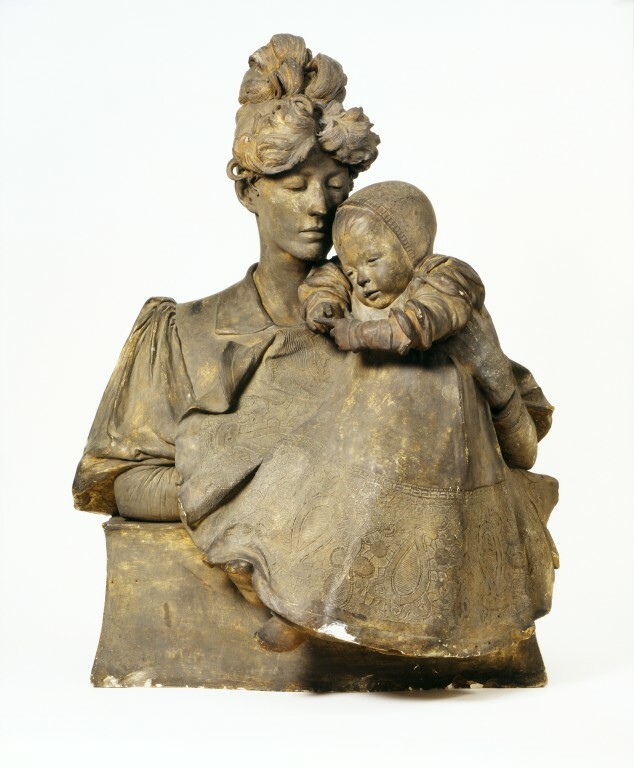 The models for the group were the sculptor's wife, Christabel, whom he married in 1893, and his son Meredith (born 17 March 1894), who later became a painter and gave this bronze and a plaster model of the group to the Museum (Mus. no. A.9-1985). As a portrait group of Frampton's young family this work is an intimate and fond expression of motherhood. 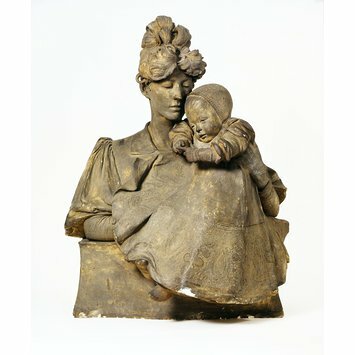 Like the best works of the so-called 'New Sculpture' produced in England in the last quarter of the 19th century, Mother and Child has many subtle layers of meaning. The mother supports the child by leaning her right arm on a shaped ledge, recalling a recognised type of Renaissance portrait, and her baggy sleeves and the child's full robe and cap also suggest a former era. This sense of an ideal group would have been further emphasised by a bright copper plaque with a white enamelled disc in the centre, which Frampton originally designed to form a backing to the sculpture. This Symbolist format connects it with Frampton's masterpiece of 1892 Mysteriach, now in the Walker Art Gallery in Liverpool. Mother and Child is a notable example of Frampton's experiments with colour in sculpture, combining as it did the coppery backboard, white disc and silvered bronze. Sir George James Frampton (1860-1928) was an English sculptor, medallist and decorative artist. He worked in an architects office before being apprenticed to a firm of architectural masons. He studied modelling a the London School of Art under W.S. Frith, and in 1881 entered the Royal Academy Schools, where he won a gold medal and travelling scholarship in 1887. Like Lanteri he was involved in the exterior decoration of the Museum, executing the spandrel reliefs of Truth and Beauty above the Main Entrance. Frampton was elected an Associate Member of the Royal Academy in 1894 and exhibited regularly across Europe, contributing to the Munich and Vienna Secession movements. Half figure of a Mother and Child. The mother is holding her son on her left side, looking down at him. The child wears a cap and a full dress decorated with a lace (?) design; he looks at his outstretched fingers. Given by the Late Meredith Frampton, Esq., who is the "child" (son) of this subject, together with A.8-1985, in 1985.